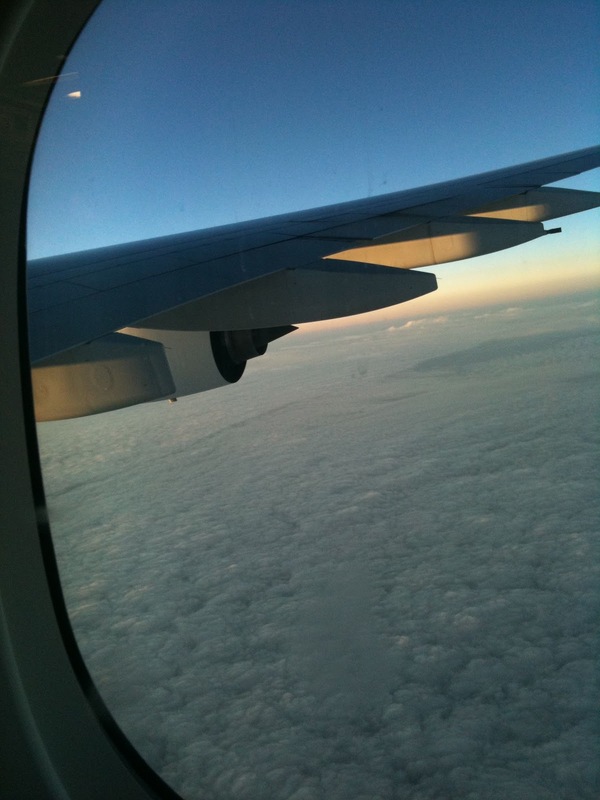 The plane I am in love with is the A380, the world's largest passenger plane. First flew it with Singapore Airlines from Singapore to Sydney last November. Then I travelled on the Qantas one in June from Los Angeles to Sydney (blog post here) This week's adventure on the mega Jumbo was with Emirates, the airline of Dubai on their service from Auckland to Sydney. Today I compare the flying experience between these three airlines. Sadly only in Economy. Sponsorship is welcomed to try the First Class product with all of them! Forty or fifty gazed, pointed and chatted displaying an excitement about flying the 22 wheeled Double Decker aluminum "Super Jumbo" aeroplane. 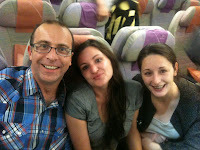 A very large number were clearly caught up in the excitement of the journey - just happy to be travelling. The type of plane seemed irrelevant in this situation. We had two large groups -a large Kiwi young rugby player contingent and a Chinese tour group on board. A few slipped nervously on board, obviously dreading the three hours inside the 73m (239ft) long metal tube. Can you believe the the Wright brothers first flight was only 37 metres (120 feet) long. In other words this plane is almost twice as long as humanity's first ever powered flight. One would love to see their faces if they ever came face to face with this plane. Emirates check in was astoundingly efficient considering there were three flights departing Auckland in a short time period -one to Brisbane, (B777), one to Melbourne (A340) and the A380 flight to Sydney. This means a potential check in number of a 1000 passengers. Plentiful desks and hired contractors directing passenger traffic made the experience easy . From queue to boarding pass was less than six minutes. This matched the Qantas check in and faster than the one at Singapore Airlines. Boarding was also efficient -and fast. The welcome aboard by the on board crew was astounding. While the Qantas welcome on the A380 had been up to the usually Qantas friendliness, I generally find the Singapore Airlines "welcome aboards" a little false and forced. 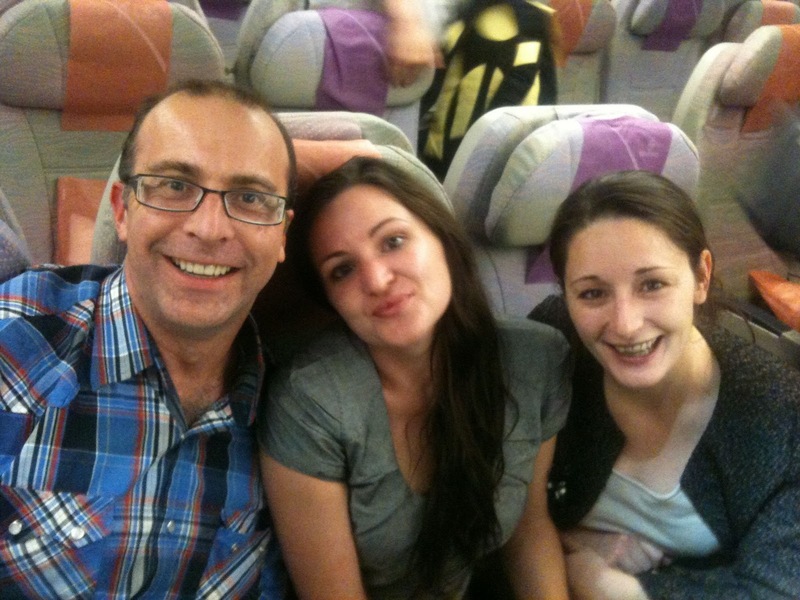 With Emirates the ethnically diverse crew members greeted you in a way that seemed personal, unique and genuine. It may not seem much but this contact reminds the passenger that they are special and are involved in the special experience of flying. I know many Airlines have reduced flight to that of a bus to the detriment of the flying experience I believe. My seat was 81K. This seat together with 81A and 68A and 68K are the best seats on the Emirates plane. Located in the emergency exit, they have no seat in front of them. Thank you to my friend Brett for this tip. On this plane I had two very fun women sitting next to me in my row -thanks for a great flight! A gentleman seated a row in front of me was a different story. When I arrived at the seat, I found the very large luggage bin a disaster area with bags badly packed and a couple trying to shove lots of bags on top of the other bags in the bin. The couple were oblivious to contents or fragility. I suggested to them, we repack which they accepted. The repacking was a success! We got all the bags into the luggage bin including mine. I made sure that small bags were on top of big ones. As I did this, I asked who owned a blue bag that had been in danger of being squashed under an avalanche of duty free. I wanted to get the owners permission before I moved it. The owner, seated in 80J, who had been watching this activity yelled at me threatening me if I damaged his bag in any way, he would be very angry. I pointed out to him, I was saving his bag and that a polite thank you would have been better. He looked at me and was suddenly chastened when he realised he was out of line. He didnt say much for the flight. Pre -flight inspections by crew were through and efficient. Safety briefing is only done over the TV monitors with the crew standing by. I prefer the way Qantas engages their cabin staff in the safety brief. To me it lends an air of seriousness --that the airline really knows its safety stuff. Takeoff on the A380 is incredible. Firstly it is so quiet! There seems to be no dramatic roar as the plane moves down the runway. Then the plane seems to simply glide up. The 380 feels like it wants to fly and is simply going back into the atmosphere where it belongs. It is 40 years since the original jumbo started flying. The advances in air technology since then have been amazing. The A380 is a massive improvement over the 747. For example the A380 produces 50% less cabin noise than the currently flying 747 models and has greater cabin air pressure which makes travel more pleasant. The windows are larger. The bins are larger. The cabin is wider and higher. And of course more people can be flown for less fuel. While Emirates has two versions of the A380: One with 516 seats and one with 489seats. However, Air France crams in 538 people into its A380 in three classes. Lufthansa reduces that to 526. Singapore has opted for 471 seats and Qantas has only 450. NB The overall capacity of the plane is 853 passengers. One airline has said it will aim of 840 seats when it gets its A380 (Air Austral). Ryanair would probably aim for 1000! The feel of all three A380s I have been on has been of incredible spaciousness. The Lavatories on the Emirates are real class with wood panelling and nice moisturisers etc! Tip: use the ones in the front of the plane. Most people seem to congregate down the back of the plane. I found the Emirates ICE entertainment to be clunky and slow to navigate compared to their counterparts on Qantas and Singapore. One of the groovy features with Emirates, however, is the cameras they have built into the nose and tail of the pane which allow you to watch takeoff and landing from any direction -although the woman next to me and I decided : "it would be not a nice sight to watch your plane crash". 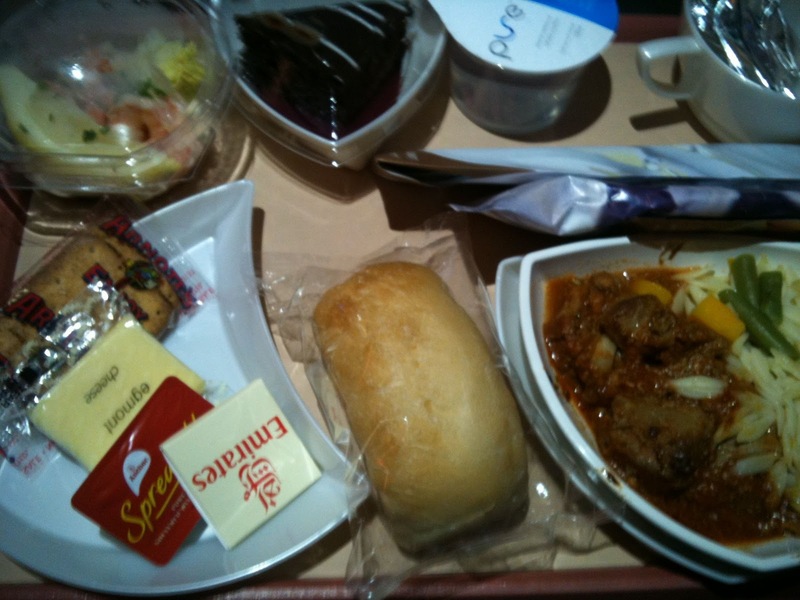 The Emirates meal was amazing. In a world where airline meals in Economy have declined or diappeared, Emirates seems to believe that giving a quality product may attract repeat business! Starting with a Prawn (shrimp) cocktail, this was followed by a main dish of lamb and pasta, a bread roll, cheese & crackers, a chocolate cake dessert and a small chocolate square filled the spot. Contrary to a popular mythology, Emirates is not a dry airline on most sectors, so wine was available with dinner. (Flying into Iran and Saudi Arabia would be a very different matter). Our landing into Sydney was bumpy (we had been forewarned) with rain, wind and low clouds. 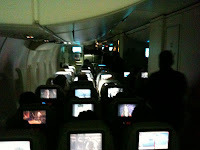 We felt very secure in our seats as the plane bounced through the cloudbursts. In July I complied my list of Top 21 Airlines I have flown. When I revise the list, guess who will be the new number one?! Really good blog.Blogs like these need to be more publicized because it’s a real view from a customer viewpoint.Airlines should take note! And please...if you get too popular and rich don’t stop reviewing economy! Seriously though......loved the review on Emirates. I have to say they are currently my favorite airline...and it’s the food that has always done it for me. Loved the company you had too. Even from the photo alone could I tell that you had a ball! Emirates is now my number 1 airline! 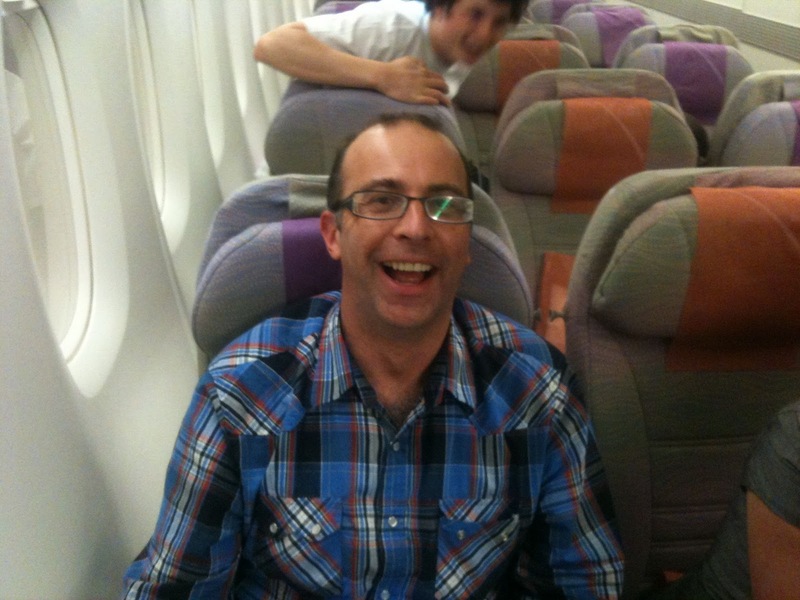 Hey Martin, fantastic review, I told you they were the best seats on the plane LOL. Have to agree that Emirates is definitely my favorite airline, if only i could travel them more :( Wish they could venture into the AUS domestic market and teach the others how it is done. I would fly them anywhere. Well I've not flown Emirates or on an A380 as yet, so you have set me two new goals! Thanks Martin!!! @Brett...SYD-PTH on an Emirates A380...that would be fun! @Andy...pleasure...keep me posted to see which you do first! I missed your question-----------a month ago....so my answer is too late.....I am sorry....how was it? 81A will give you the best view out of Dubai on take off! I've really enjoyed browsing your blog posts. After all I'll be subscribing on your rss feed and I hope you write again very soon! huge thumbs up for the excellent info you've got right here on this post. I'll be returning to your web site for more soon. that cover the same topics talked about here? I'd really like to be a part of community where I can get feed-back from other knowledgeable people that share the same interest. If you have any suggestions, please let me know. Thank you! Hola! I've been following your blog for a while now and finally got the courage to go ahead and give you a shout out from New Caney Texas! Just wanted to mention keep up the fantastic work! wound up here "Three Airlines-one plane- comparing the A380". usually do not mind. Could it be only me or does it give the impression like some of the comments come across like written by brain dead folks? up. I go to from work, and our connection there's fairly good. Do you assume the problem may very well be on your end? Interesting blog....My daughter works as cabin crew on Emirates and ironically safety training is a constant with the airline...all cabin crew are tested on safety before each flight...if they fail the given question they are off loaded, fact.